Gertie Reece Foy is on a mission to be the best fifth grader in the universe and she never gives up! This is one ten year old who cannot be stopped. Kate Beasley weaves an uplifting tale that will bring tears and giggles. 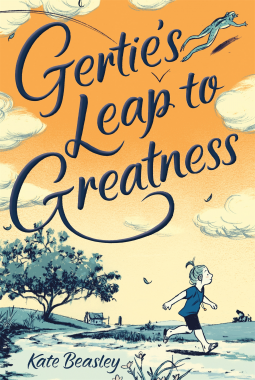 Gertie's Leap to Greatness is an outstanding debut that makes me hope, that at ten years old, I was as cool as Gertie. It's realistic fiction written with an overdramatic voice that demands attention. The hope that her mission will succeed is what drives this plot and has readers rooting for Gertie to go get 'em. Jillian Tamaki's illustrations remind me of my own elementary school days pouring over similar stories like Fudge and Ramona Quimby. This story is destined to be remembered along with those endearing classics. It's the kind of story that makes you instantly happy and eager to share with others. Gertie Reece Foy will leap off the pages of the book and steal your heart!